Extra heavy duty rubber ring link matting. This indoor/outdoor all rubber mat is not only ideal for matwell areas but also for wet areas where a drainage facility is vital, e.g. ships, oil rigs, breweries, factories, etc. 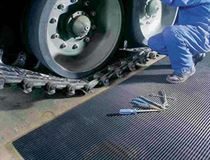 Spillages of dirt, mud, sand, grit, water and oil are kept below the main slip resistant surface of the matting. Large floor areas can be simply covered using a series of mats joined with special connector clips. Ad-Mat brush infills available in Blue, Black, Green, Grey, Red and Yellow to enable lettering to be created.